Ballet Arizona is dedicated to entertaining the community through powerful ballet performances that preserve and celebrate classical dance. But did you know we also serve to educate and inspire? Our community outreach programs touch the lives of more than 35,000 children each year. Ballet Under The Stars – Free Park Performances! Every year, Ballet Arizona gives the gift of free ballet performances under the stars. These events take place in parks around the Valley and are designed to provide free access to a live professional ballet complete with a stage, lighting, costumes, and beautiful Arizona weather. Families get to experience what goes into a live ballet performance as the unique choreography comes to life with music and dance. 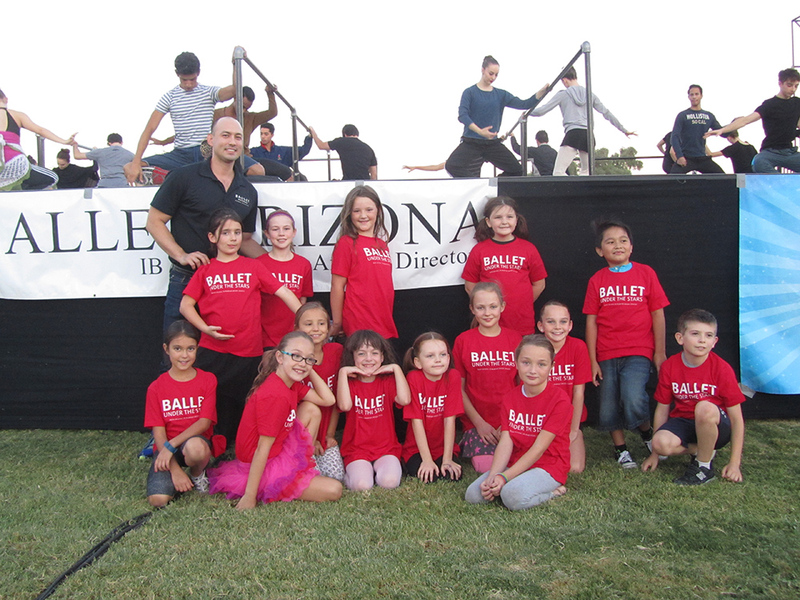 For many Valley residents, their very first exposure to live professional ballet is Ballet Under the Stars. Each season, Ballet Arizona partners with over 80 community service organizations from across the Valley, supporting children and families in underserved neighborhoods. For one night, we open the doors to Symphony Hall so that these families may celebrate the holiday season at our production of The Nutcracker free of charge! Class Act is a Ballet Arizona program where kids in the community can learn, create, and discover through dance. Children get to interact with our professional dancers as they travel around to local elementary and middles schools to teach dance. Over the course of three weeks, the kids learn choreography and performance tips that they get to perform at a Ballet Under The Stars event. Especially through the eyes of a child, these community dance experiences expand their way of thinking and open their hearts to the beauty of classical ballet. By exploring the elements of dance and choreography, children learn how to use their imaginations to foster new ideas and creative solutions. If you’re interested in experiencing the learning benefits of dance in your child’s community, check out one of our upcoming community events.